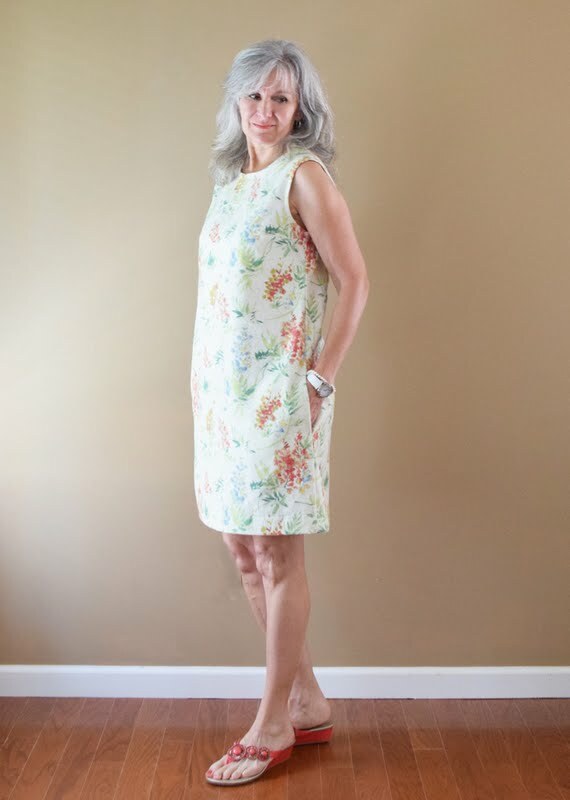 In my quest for the perfect easy-breezy summer dress, I think I may have finally found it in a simple shift dress custom made to fit me. Having made Ottobre 02/2016 No. 10 Glorious shift dress last year out of lovely linen red poppies fabric, it left me longing for a more 'fitted' shift dress, if that even makes sense! 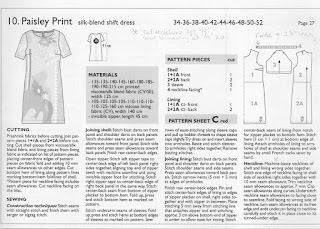 A shift dress is known for its shapelessness..... usually a simple A-line dress with bust darts and no shaping at the waist. 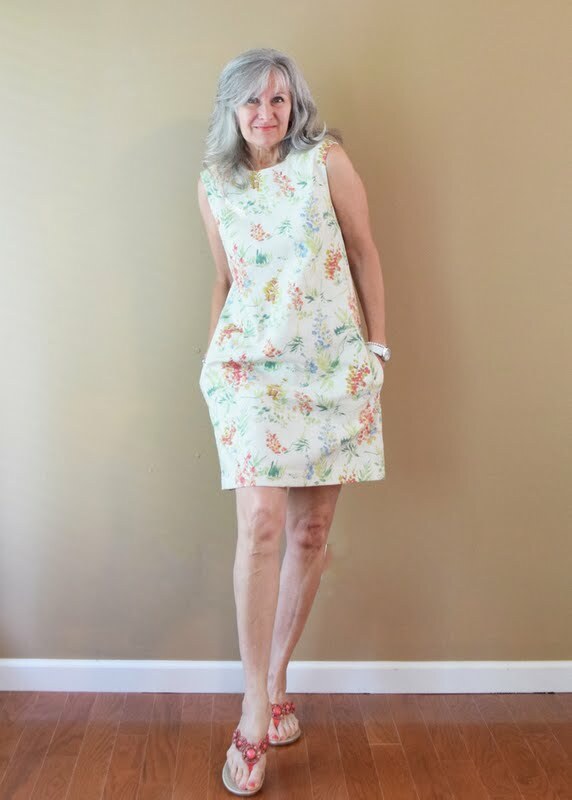 A shift dress isn't the most flattering fit on me I suppose, but for comfort on hot and humid summer days, it can't be beat. By the way, I added in-seam pockets. Kinda' surprised the pattern did not include them. With all the fabric floating around, there's plenty of room to slip pockets in. I've lost more weight so I was careful to take new measurements before starting this project and I was glad I did as they'd changed enough to change my sizing. 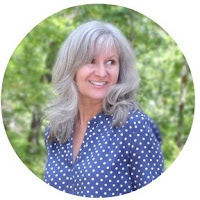 I've also been watching Nancy Zieman's (free) videos about her Pivot and Slide Method to achieve the perfect fit and applied some of what I learned here. This dress is a size 36 bust and waist graded to a size 38 hips using Nancy's method. I really like the fit and the way this dress looks 'custom' fit for me. I've struggled with garments not fitting quite properly through the shoulders that then produces an odd extra bit of fabric in the middle of the neckline, and as you can see in the photo below, the neckline is perfectly smooth with the shoulders laying where they should. Love this neckline!! It's not too chokingly high and lays on the neck in a flattering way. Back view... not much to say here.... no darts, invisible zip that was a breeze to put in with my invisible zipper foot. Why I ever waited so long to buy one of those is beyond me!! Makes zipper installations ever so easy. Let's turn to some of the details now.... 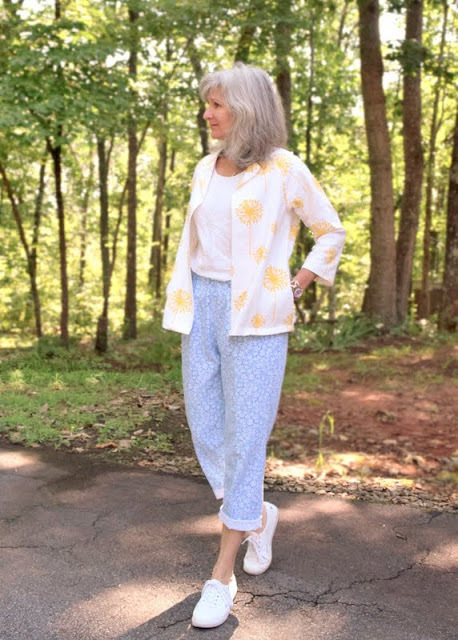 I cannot believe this was my first garment to make from this Ottobre Design Woman 05/2015 issue! This is a fabulous issue full of all sorts of great patterns. I made no. 10 that she calls Paisley Print silk-blend shift dress. Ottobre's pattern names are always confusing to me, as in this case my fabric is neither Paisley Print nor silk-blend. So I shall therefore call this pattern Ottobre 05/2015 no. 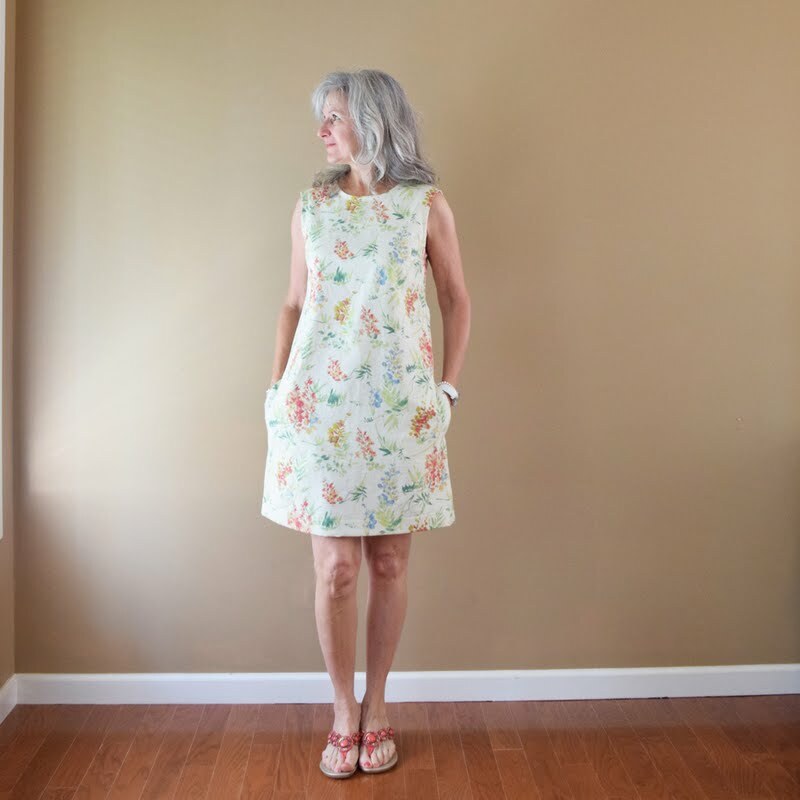 10 Shift Dress. Simple. 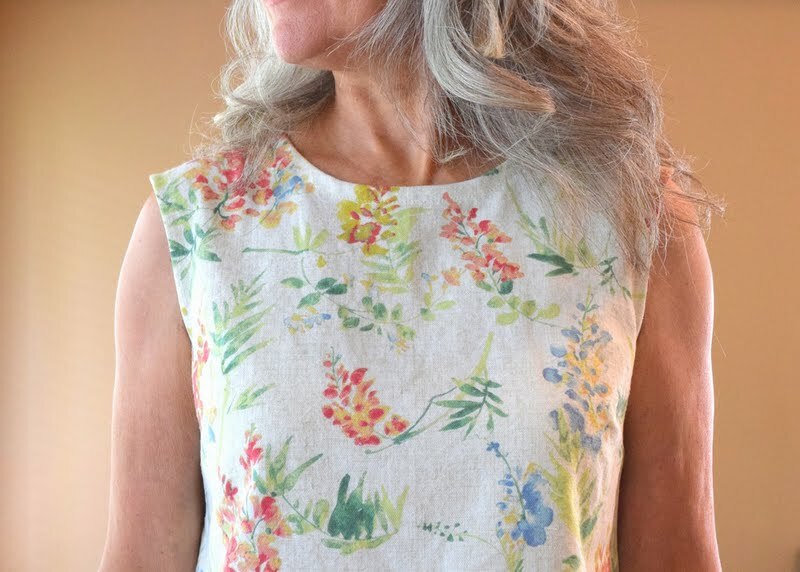 The pattern gives instructions for a lined dress with sleeves, but with my lovely linen blend I did not want a lining as I wanted my fabric to breathe and be cooler to wear. Nice to have the sleeve pattern as I may make this again in the future using the sleeves, but for now sleeveless is what I wanted. Also you might notice there are no facings. 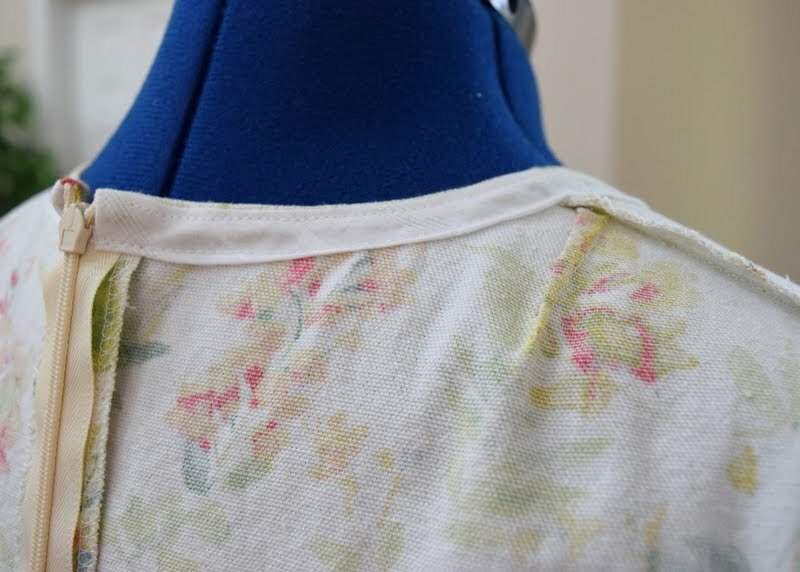 The neckline is finished with bias tape whose installation is a terrible weakness of mine. I toyed with drafting facings, but decided to embrace the bias binding as I need more practice in this area. Both neckline and armholes are finished with self-made bias binding. Probably should've used a little more sturdy fabric for the binding, but really liked the thought of this soft handkerchief cotton against my skin. Followed Carolyn's tutorial for the neckline and about the same for the armholes, other than sewed the binding on with all the creases already ironed in. Was sure to understitch all seams before turning and top-stitching. 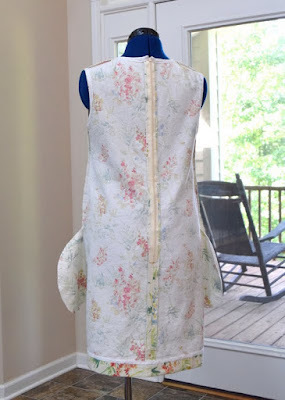 Used lots of pins and sewed ever so s-l-o-w-l-y when top-stitching. Pleased to see that all came out well with no puckers. Inside out. Such a simple dress to make. 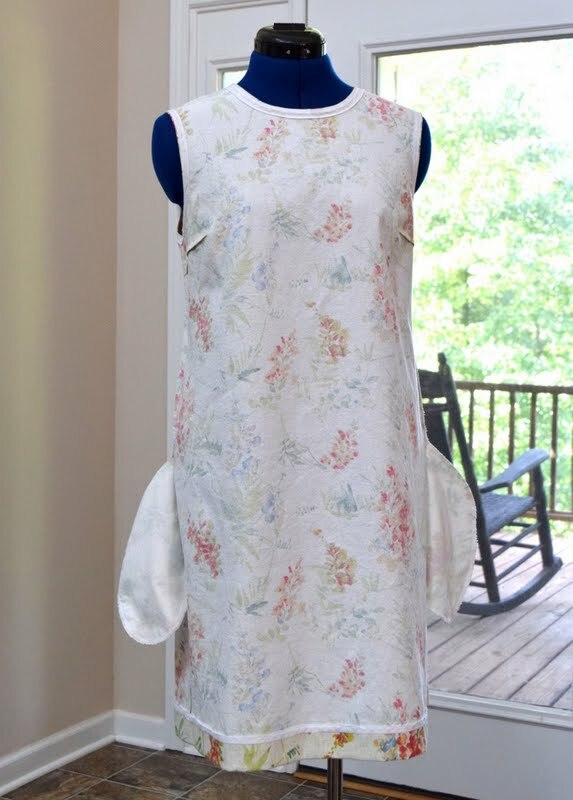 When adding the pockets, I thought about how I did not want the pockets to bind on the linen fabric, so used white cotton fabric for the front of the pockets bags and the floral linen for the back. I've made the mistake before of using different patterned/colored fabric for both pieces of the pocket bag and sometimes that does not look right. But if you only use the different piece for the front of the bag, and self-fabric for the back of the bag.... all blends in well. Ottobre has you add a 3/8" seam allowance and in this case that was perfect as I serged most of the seams. But I really like a 5/8" seam allowance for the center back where the zipper lays, and that's what I did here. Easier to sew in the zipper to me. 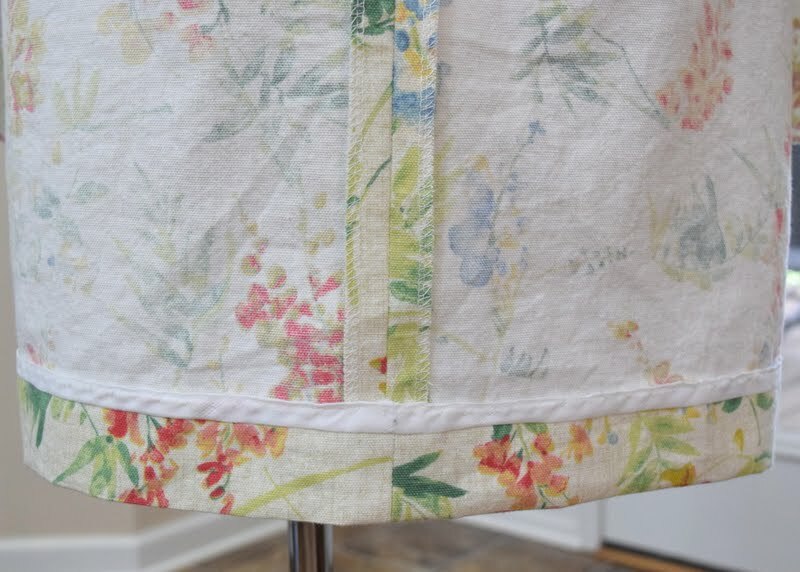 A little tip that has worked well for me to close the back center seam below the freshly installed invisible zipper.... is to begin sewing with a regular zipper foot, from the hemline up to your carefully pinned seam. No odd bumps or bubbles! 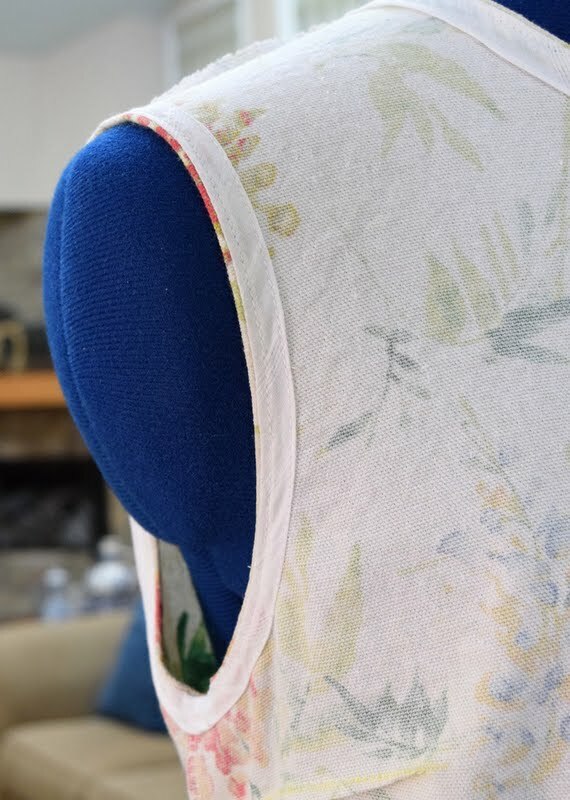 In a simple make, it's fun to work on other skillsets too, so I covered the serged hem seam with self-made bias binding and hem-stitched it on my machine. This produces an invisible hem with a pretty covered seam on the inside. Not the best covering of the zipper tape at center back, but it was the best I could do this day. But what I also want to show here is the back shoulder dart. 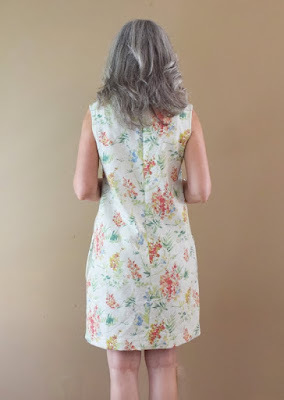 One of the things I like about Ottobre dress patterns, is that she usually includes some sort of back neckline, or in this case back shoulder dart. These seem to help with fitting for me in these areas. No other modifications were made to this pattern. Simple. Speaking of simple, as I began to write this post today I began to wonder about the history of the simple Shift Dress. 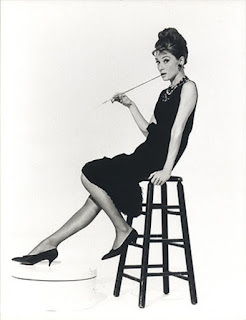 After a quick Google search, according to ShiftDress.com, it all started with Givenchy designing Audrey Hepburn's LBD in the movie Breakfast at Tiffany's. The website included an interesting little bit about Lily Pulitzer's humble beginnings as she designed a simple shift dress to wear while selling fresh squeezed orange juice at her husband's fruit grove stand in Florida. Her clothing empire took off from there. The first person I thought of, when pondering the beginnings of the shift dress, was Twiggy. She's definitely part of the Shift Dress' iconic history. And then of course one could not forget the beautiful Jackie Kennedy Onassis. It also occurred to me that the first dress I ever made was a shift dress. Though my mother was an accomplished seamstress, she never taught any of her skills to me. Instead, she enrolled me in a summer sewing class at the local fabric store one summer when I was probably around 12 or 13 (c. 1972/1973). The pattern was a simple shift dress and I still remember the vibrant 'mod' green geometric print I chose to this day! 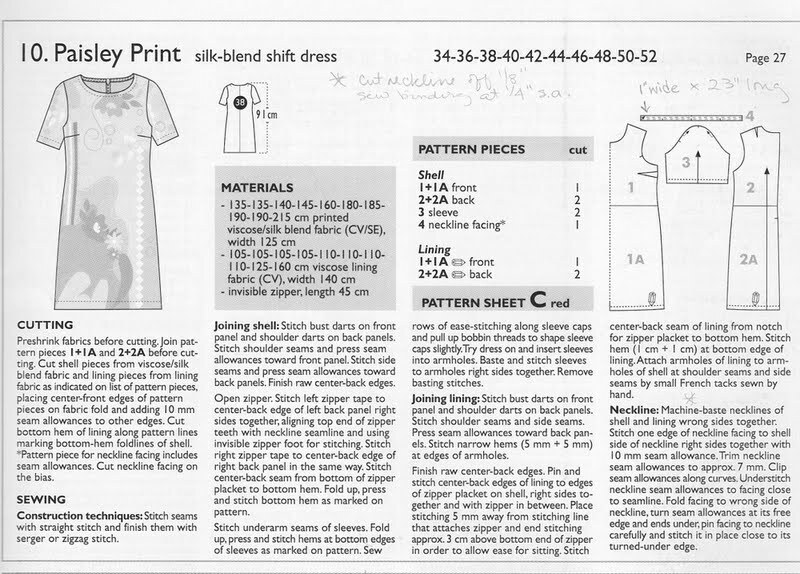 Unfortunately nothing was retained from that experience other than the instructor had us throw away and discard the pattern instructions to blindly follow her lead in making our dresses. I remember hiding my instructions but she found them and they were gone. Retained.nothing. And in the sport of having great fun..... my version of Twiggy. Ha!Ha! Oh, the fit is sublime and the bindings are immaculate. 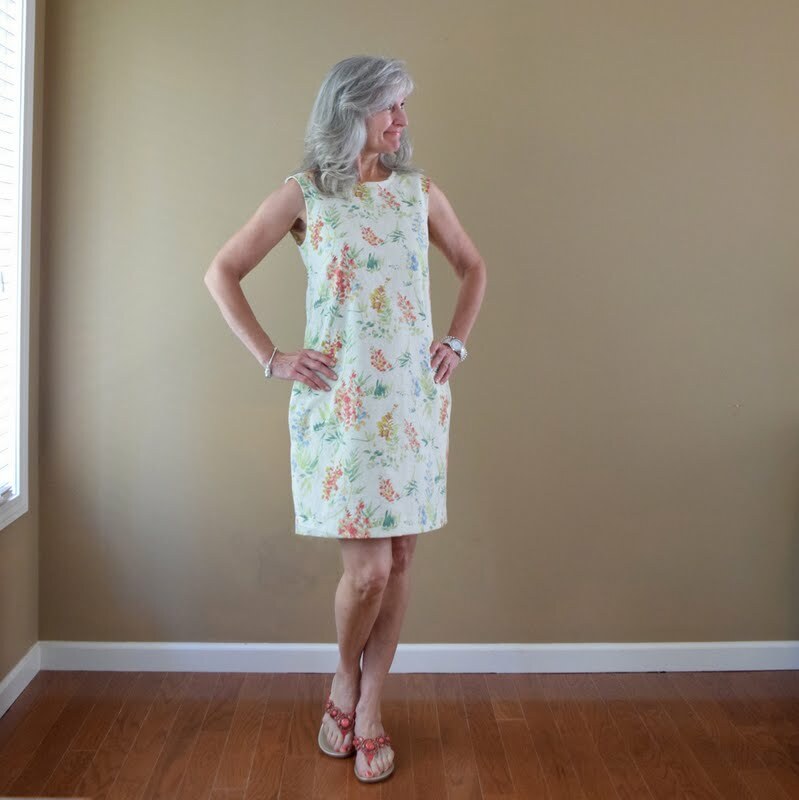 Don't you just love a shift dress? I'm discovering a love for them too. So comfortable yet pulled together. It is beautiful. Can you please tell me the width at hemline? This is a measurement I always look for on patterns,as it tells so much about fit. Yours seems a bit narrower than usual. I noticed the pattern did not list this. Very pretty! You look cool as a cucumber. Fun to see you Belize shorts flash by in this post. I'm working on a pair for myself right now! Bought the pattern because of you; your versions look so flattering and comfortable I decided I needed to get in on some of that action. I have your review up on my screen to refer to while I sew! Beautiful dress! My favourite is shift dresses :) My mom love them too and I remember her buying us both shift dresses to wear in the summer (1967 - 1973). 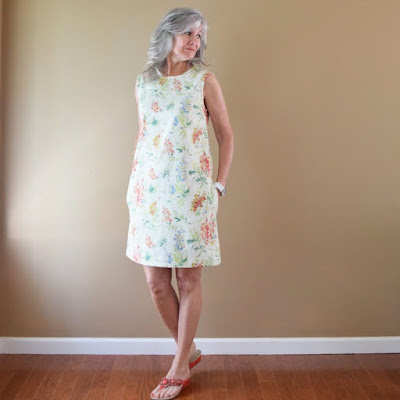 There is nothing cooler and more comfortable than a light cotton shift dress. It turned out as pretty as can be. Great work with adding the pockets and your bias binding looks terrific. Don't lose too much weight; you don't want to end up like Twiggy! It's a gorgeous dress! I'm sure it will keep you nice and cool this summer while still looking chic! It's lovely. I always look to you for Ottobre styles made up. I love their basic but lovely aesthetic and I really have to bite the bullet and trace them out. My shoulders are so tiny, they are at least 3cm shorter than the smallest measurement of Ottobre so that puts me off too. 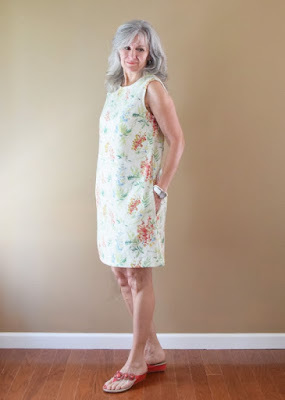 I always think of shift dresses as sort of skimming fitted - they are not totally shapeless, and if nicely done, give a hint of a nice figure underneath. And cool to wear as well. The only shape in summer, if you ask me. And such a pretty, cool, looking pattern. All nicely done, and I am sure will give lots of wearing pleasure. Effortlessly chic and beautifully sewn too. Love it! this is so very beautiful Lisa!! such a divinely pretty print, and you made the perfect dress to showcase the sprays of flowers. 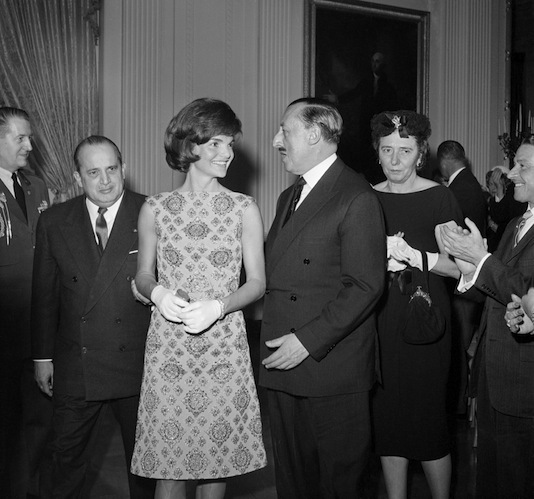 You look every bit as cool, beautiful and elegant as either Twiggy or Jackie! Such pretty dresses.. Love the floral.